During the winter of 1986 I was working in construction near Oakland, California. It is not unusual for construction workers’ hands to become very painful during the winter season from working with concrete, wet lumber, mud, etc. My hands were no exception that year. They were literally cracking open and bleeding at the joints in the fingers and thumbs. Stopping work because of hurting hands is simply not an option in the construction industry. You grit your teeth, keep working, and finish the job — but do further damage to your hands in the process. The only respite occurs on weekends. My co-workers and I had been consoling each other daily on how bad our hands had gotten. The pain is similar to “paper cuts” occurring many times an hour. One morning I left for work at 5:00 a.m. to pour concrete, and pulled into a gas station to fuel up. 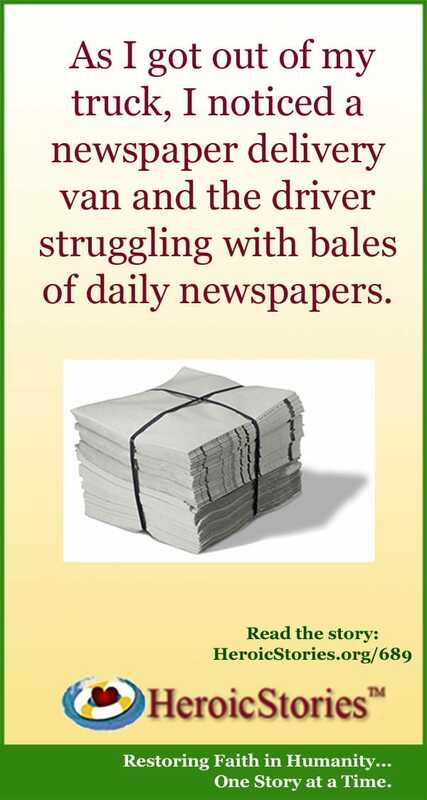 As I got out of my truck, I noticed a newspaper delivery van and the driver struggling with bales of daily newspapers. I took a second look at noticed that the man had some sort of birth defect and had no forearms. At the area where most people have elbows, he had appendages that looked more like an otter’s flippers than hands. I was amazed to see him doing a job that would otherwise require a very physically gifted person. Still, he was somewhat struggling with the larger bundles because his arms simply weren’t long enough to encircle the bales. Instead he had to “pinch” the bundles and lift them with his stubby arms. On my way to pay for the gasoline, I stopped and asked him if I could help him in any way. He politely refused my offer. A few minutes later while I was refueling, he exclaimed, “Hey buddy, I could use some help. Would you mind tying my shoes for me?” As I was tying his shoes, he went on to explain that tying his shoes was the ONLY thing he couldn’t do for himself. He thanked me as I got in my truck and started to drive away. I came to a full stop and looked back at him as he was getting into his van. I looked down at my hands. Suddenly it hit me: I had been complaining about my hurting hands for weeks. That man back there would do anything, anything at all, to have my cracked and bleeding hands. Every winter when my hands start cracking and bleeding, I think back to that chance encounter in 1986. That man back there would do anything to have these hands. And just like magic, they stop hurting. Available in The Best of HeroicStories, Volume 2. Sometimes we forget how truly blessed we are. I had a terrible time one winter with cracked skin on my hands and had to do the above to allow them to heal. I found that the Mt. Dew I was drinking exacerbated the problem. A bloke in the country town where I grew up, was born with arms that ended halfway down each forearm. He could do just about any task for himself without assistance, the top button of a dress shirt, being a very rare exception. He was one of the few people I knew who actually used his change pocket for change. He played footy (Aussie Rules) for the town team, junior (U19), reserves & seniors, and you DID NOT want to get into a fist fight with those clubs of his. Strapped into today’s top of the line prosthetics he’d be handicapped. I guess what I’m saying is be very careful offering help to someone who appears “challenged” in some way. By all means, commit random acts of courtesy, like holding a door, but don’t go offering to do anyone’s job for them, unless you would do the same for anyone else. Oh, Scott, I’m late to the game, but have you tried slathering on Udder Balm or Eucerin?